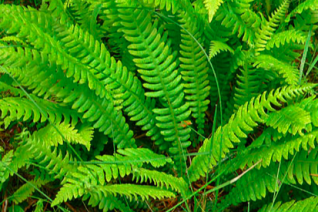 Deer fern is a lovely native evergreen clumping perennial that is invaluable in wild areas. The tiered upright and then settling to horizontal mid green glossy fronds are handsome all the time. To 2′ wide and 2′ tall (when fronds are emerging). Rich, moisture retentive soil high in organic matter. Light summer water in part shade to shade. 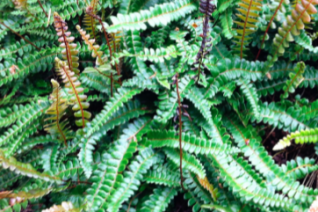 Familiar fern of the Oregon Cascades but very widespread. High deer resistance. Oregon native plant.